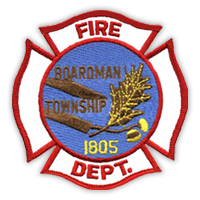 The Boardman Fire Department is located in Boardman, Ohio, between Columbiana and Trumbull Counties. Members of the fire department provide fire suppression, extrication, rescue and hazardous materials response, and also respond to other emergency situations when called to duty in the township and surrounding areas. The Department currently has a Class 5 ISO rating. Members of the department are required to attend the Firefighter 240-hour training course and be First Responders. 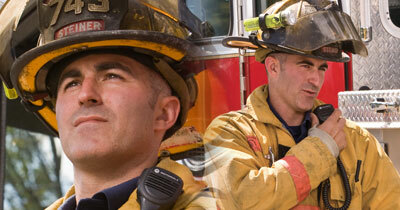 The Boardman Township Fire Department is staffed by 43 full-time firefighters and officers. They work a three-turn schedule. Each turn works 24 hours on duty with 48 hours off duty. This amounts to a 56-hour work week. The Fire Chief, fire inspectors and support staff work a normal 40-hour week. There are 11 firefighters, one captain and one assistant chief assigned to a turn. At full strength there are 13 firefighters on duty between the three stations. Having a full roster is rare due to vacations, sick time and injuries. The minimum staffing is eight on duty. Eight firefighters are below the recommended national standards for the staffing of apparatus and manpower on the scene of an emergency. The Boardman Fire Department answers about 3,200 calls for service every year. A majority are for medical emergencies. The rest are composed of structural fires, vehicle crashes, automatic fire alarms, hazardous materials responses and other miscellaneous calls. As members of the Boardman Township Fire Department, we know that our job to save your life and the lives of your family and to protect your property — whenever you need us. We may need to cut you out of a car crash or pull you out of a fire in your home or at a local business. We may need to keep you alive during those first golden minutes of a medical emergency before you’re transported to a hospital. We may need to keep a kitchen fire from destroying your whole house and every memory in it. Or we may need to evacuate your children during a natural disaster or incident at their school. You can count on the fact that we are ready, capable, trained and equipped to do this 24 hours a day, 7 days a week, 365 days a year. We maintain a highly trained, well-equipped department that keeps pace with the ever-changing nature of firefighting, and keeps up with redevelopment and growth in the township. The science of firefighting is evolving, and homes and buildings are being constructed with new materials (which are sometimes more combustible and dangerous) that require different approaches. We stay on top of all of these developments. We have a number of tall structures in the Township that require upgraded equipment to reach. And we make a continuing effort to position our resources to allow for the fastest possible response times. We communicate with and engage the community. We keep Boardman residents aware of the many facets of our department. We offer fire station tours, extensive fire prevention programs and school presentations, and we participate in neighborhood events.